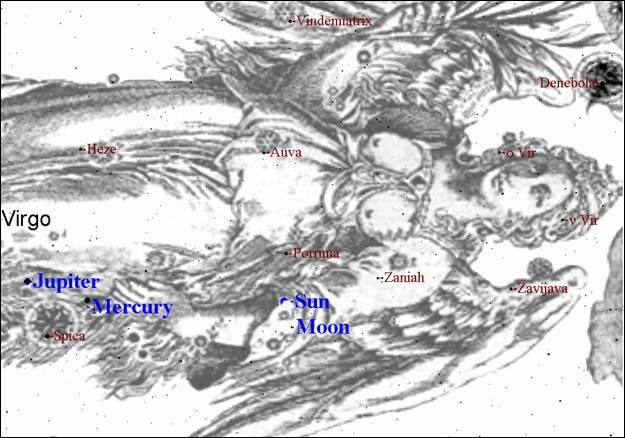 It is expected that the next new moon will be sighted from Jerusalem near sunset on October 5, 2005 at which time Bethulah will be clothed with the sun and the moon will be beneath her feet. This event occurs about every two to three years as seen from Jerusalem, but every year as seen from some point on Earth. There is a very slight (but not likely) possibility that the new moon will be visible near sunset on October 4. Chart 401 shows Bethulah about 5 minutes after sunset with the New Moon beneath her feet on October 5, 2005. 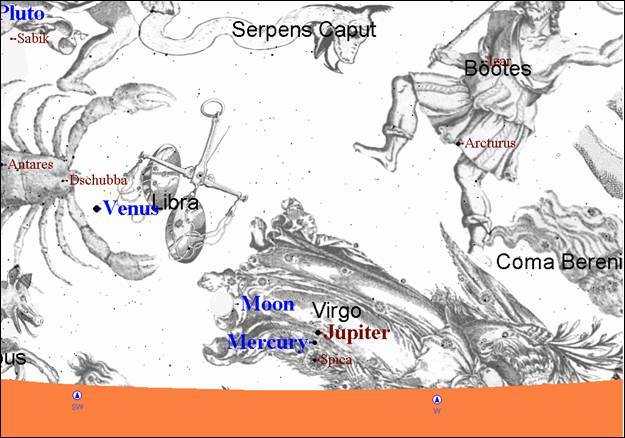 This chart also shows a notable conjunction of Jupiter, Mercury and Tsemech (Spica) in Bethulah at the same time. This conjunction will not be visible to the naked eye (perhaps Jupiter will be visible) for they are too close to the sun and the sun’s glare will block them out. Below is a simulation of the planets and star in conjunction shortly after sunset on October 5. There is only a very small white dot for Jupiter and Spica is so dim that the program does not label it. 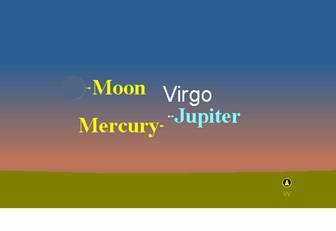 Spica and Mercury will set below the horizon before it is dark enough for them to be visible. Jupiter may be visible shortly before it sets. I would not consider this a great visual sign and it will be far from being seen as “very bright” as some are suggesting. There will be an Annular eclipse of the Sun in a path across Spain and northern Africa on October 3, 2005. This will be seen as a partial solar eclipse from Israel. Chart 402 shows the position of the sun and moon in the constellation Bethulah as seen from Jerusalem at the time of the eclipse on October 3. The partial eclipse as seen from Jerusalem will start around 11:37 a.m. Jerusalem Time and will end around 2:32 p.m. The below diagram shows how much of the sun will be covered by the moon as seen from Jerusalem near the peak of the eclipse at 1:00 p.m. This is an interesting event in light of the fact that Bethulah (the woman) will be clothed with the sun and the moon beneath her feet at the New Moon sighting two days later. Rev. 12:1 – And there appeared a great wonder (sign) in heaven; a woman clothed with the sun, and the moon under her feet…..
We will just have to wait to see if this is the time for the rest of this scripture to be fulfilled. There will be a very slight partial lunar eclipse visible from western United States in the early morning on October 17, 2005. This will only be visible to the trained eye and most will barely notice it if they see it at all. This eclipse will not be visible from Israel. The eclipse will also be visible from Japan, Australia and New Zealand in the evening sky. The umbral phase (dark shadow) will last from 4:34 to 5:32 a.m. Pacific Daylight Time. 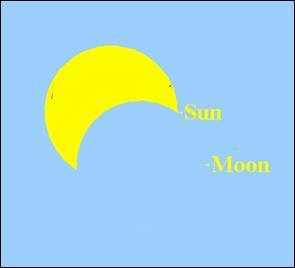 Below is a diagram of the eclipse at its peak. The red shadow at the bottom of the moon is the extent of the umbral shadow as seen from the Pacific Northwest. Just a glazing eclipse. The gray shadow is the penumbra, which is very difficult to see except by experts in eclipse observing. 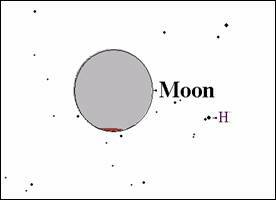 The chart below shows the position of the moon in the constellation Pisces during the peak of the eclipse. 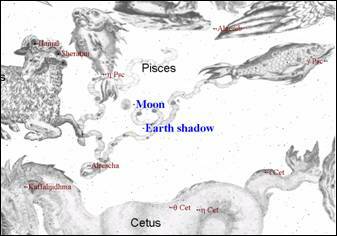 The last time there was a lunar eclipse in Pisces were the two total lunar eclipses, both on, or on the eve of, the Feast of Tabernacles in 1996 and 1997. Both of those eclipses were easily visible from Jerusalem. No, this is not a hoax. Mars approaches close to the earth as the orbital paths of the two planets allow about every 2.2 years. In a cycle of about every 79 years they get closer than in normal 2.2 year cycles. On August 27, 2003 Mars came closer to the earth than it has in about the last 70,000 years. It will be at least a few centuries before it is that close again. At that time Mars shone very bright at a magnitude –2.88. Mars is now approaching its closest point to the earth in its normal 2.2 year cycle. It is even shining brightly now in the eastern sky about an hour after sunset. Mars will continue to brighten throughout October and on November 6, 2005 it will be at its brightest in its normal cycle. On November 6, 2005 Mars will be shinning at a magnitude –2.33. It will be the brightest object in the sky, other than the moon, that evening and for many evenings in October and November. I will cover this more in the November newsletter which will most likely not be published and posted to the website until after the November 6 event. I will be leaving for New York on October 5th and will be returning to Oregon on October 22. As a result, I will not be processing orders between October 5 and 22. Then I am off to Florida on October 27, where I will be doing a Biblical Astronomy seminar in Wauchula, Florida on Friday evening October 28 and all day Saturday and into the evening on October 29. I will be returning to Oregon on October 30. I will start the November issue of Biblical Astronomy after a few days of rest. I did a weekend teaching at the Feast of Tabernacles at a get together in Montague, California this past weekend (Sept. 23-25) and slept for 17 hours on Monday. I didn’t get much sleep if any the week before and during the weekend. I am still in a bit of a burnout stage writing this newsletter and getting ready for the New York trip. I pray that all I have written is readable and reflects what our Father wishes to convey in His good pleasure. YHVH bless you and keep you. with Biblical Astronomer and Author Robert Scott Wadsworth from Oregon City, OR starting on Friday October 28, 2005 at 6 p.m., and continuing on Saturday October 29, 2005 at 9 a.m. There will also be a special presentation of Praise and Worship by Jerusalem Rivers. Everyone is welcome. Registration is not required, but would be helpful to get a correct count for seating, food and drink. Please call 941- 628- 0169. Biblical Astronomer and Author Bob Wadsworth will reveal the ancient biblical names given to the constellations and the planets using computer digital imagery projected onto a giant nine foot screen, as he narrates about the following subjects; The Bible references that actually name the constellations and planets; Biblical Astronomy versus Astrology; Where the constellations came from; The Biblical meanings of the constellations; Who named the stars; The prophetic meaning of the names of the stars in light of the first and second coming of the Messiah; Recent celestial events that point to the second appearing of Yahshua HaMashiach (Jesus Christ). Session 1: The Biblical meaning of the constellations and planets. The 48 constellations of the Mazzaroth will be covered in relation to the first and second appearing of the Messiah, and their relationship to Israel and the called out of God. Session 2: The Fall of Adam, The Great Flood, The birth of Abraham; Dates for the Exodus; The Assyrian captivity of the Ten Northern Tribes; The Babylonian captivity of Judah; The birth of Jesus Christ; The Crucifixion, Resurrection, Ascension of Jesus Christ and Pentecost. Session 3: This session will discuss very rare celestial events concerning the Second Coming of the Messiah. From 1995 to the present certain events have happened that are pertinent to the return of the Messiah. More unusual celestial events have occurred in the past eight years than at any other particular time. This is a fascinating journey of biblical truth that every Christian should experience. You will never look at the sky and the stars the same ever again. We hope to see you there. For directions call Steve Cantu at 863- 735-8671. Decan constellation to the Sign Libra. 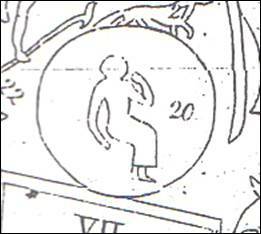 (In the ancient Zodiac of Denderah the constellation is called Sura, a lamb). The Greek names of this constellation are Thera, a beast, and Lycos, a wolf. Both are perversions to the original picture and meaning of this constellation. The Latin name is Victima, the victim. Isaiah 53:7 – He was oppressed and afflicted, yet he did not open his mouth; he was led like a lamb to the slaughter, and as a sheep before her shearers is silent, so he did not open his mouth. Stars in Lupus and the meaning of their names. The stars in this constellation are dim and their names have thus far been lost to antiquity. More than 22 stars have been catalogued. None of them are higher than 4th magnitude; most of them are 5th and 6th. The following are excerpts from E.W. Bullinger’s The Witness of the Stars, pp. 51, 52 concerning this constellation. “In the ancient Zodiac of Denderah He is pictured as a little child with its finger on its lips, and He is called Sura, a lamb!” “All this pointed to one and the same great fact, viz., the development and explanation of what was meant by the bruising of His heel! It meant that this Promised Seed of the woman should come as a child, the He should suffer, and die upon the Cross, for (insert Isaiah 53:7 here). Hence, the constellation prefigures a silent, willing sacrifice – Christ Jesus, who, “being found in fashion as a man, humbled Himself, and became obedient unto death, even the death of the Cross” (Phil. 2:5-8). 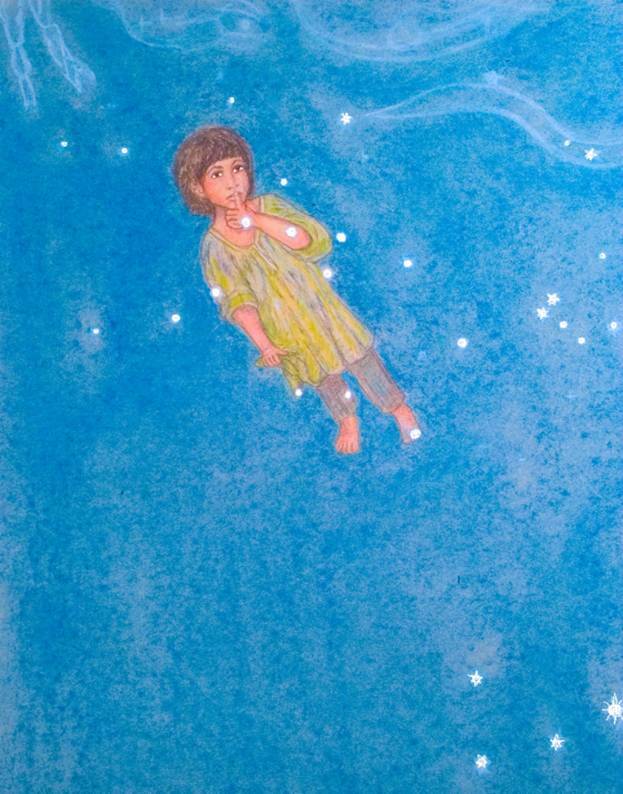 We fashioned this constellation picture after the picture in the Denderah Zodiac shown below, though with a few changes.